Spring has sprung in River Heights, along with a brand-new cupcake café! The Lucky Ladybug, run by twin bakers and celebrities Gwendolyn and Carolyn Porter, is the talk of the town. Nancy, Bess, and George can’t wait to taste some of the delicious cupcakes! But on the day of the opening, the ceremony—and the cupcakes—are ruined by hundreds of live ladybugs that invade the store. 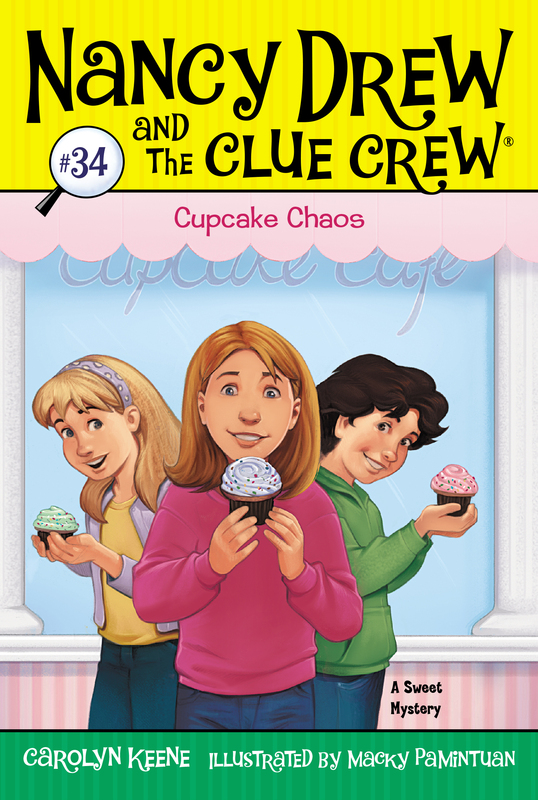 It’s up to Nancy and the Clue Crew to get to the bottom of this cupcake disaster before the Lucky Lady Bug Cupcake Café has to close for good! Nancy’s best friend George Fayne shrugged. “Maybe spring hasn’t sprung yet!” she said. “This is my favorite season!” Bess Marvin, Nancy’s other best friend, said with a smile. Nancy smiled. Outside it was chilly, but inside George’s kitchen it was warm and sunny. While George’s mom worked in her home office, the three BFFs sipped cocoa around the kitchen table. The three friends reached across the table to high-five. Not only would the Lucky Ladybug be the first cupcake bakery on Main Street but the owners, Gwendolyn and Carolyn, were practically superstars! The Porters were identical twins. They looked alike—and even baked alike! “Then I’ll keep my eyes closed!” Bess joked. George smiled slyly as she stood up. “Are you ready for a big secret?” she asked. “And best friends?” Nancy asked. “I’m about to tell you, aren’t I?” George said. She walked over to the huge steel fridge. Mrs. Fayne was a caterer and needed an extra-big refrigerator for party food. “Ta-daaa!” George sang as she pulled the door open. Nancy gave a little gasp. She brushed her reddish blond hair from her eyes so she could make sure what she was seeing was real. . . .
“Lucky Ladybug cupcakes!” Nancy said. “What are they doing here?” Bess asked. “I want a taste!” Bess squealed. “Me too!” Nancy said as she and Bess ran to the fridge. The girls gazed at the dreamy-looking cupcakes. Nancy’s favorites were the cupcakes with the sunflower design. Bess’s favorites were the bright purple ones. Nancy thought the cupcakes looked yummy. But were they the best? “I wonder if those cupcakes taste as good as Olivia Chow’s,” Nancy said. Olivia Chow was in the girls’ third-grade class at River Heights Elementary School. Every Saturday she sold her own cupcakes from a table she set up on Main Street. “There’s only one way to find out,” Bess said, reaching out her hand. Eight-year-old Deirdre was spoiled and a bit snooty. She usually got whatever she wanted, including her own blog, called Dishing with Deirdre. “How did you get in here?” George asked. “How did you know we had Lucky Ladybug cupcakes?” George demanded. “News reporters know everything,” Deirdre said. “You mean gossip girls,” Bess muttered. George stepped in front of Deirdre. “Those cupcakes are a secret until tomorrow,” she said. “How can I write about them if I can’t taste them?” Deirdre whined. “You’ll have to wait until tomorrow, like everyone else,” Nancy said. Nancy glanced sideways at Bess and George. They weren’t silly detectives—they were awesome detectives. They had their own detective club, called the Clue Crew. They even had cool headquarters in Nancy’s room! The girls forgot about Deirdre as they gave the treats one last gaze. “Lucky like a ladybug!” Nancy declared. She couldn’t wait for tomorrow—and for the best cupcakes ever! Nancy giggled as Hannah Gruen passed around the platter of veggie burgers. Hannah was the Drews’ housekeeper and an awesome cook. But she was also more than that. Nancy’s own mom had died when Nancy was only three years old, and ever since, Hannah had been like a mother to her. “What does the mayor have to do with it?” Nancy asked. “Why not, Daddy?” Nancy asked. Mr. Drew smiled as he poured dressing on his salad. “Cupcakes aren’t exactly filled with vitamins, honey,” he said. Suddenly Nancy heard a bark. It was her puppy, Chocolate Chip, in the front hallway. She excused herself from the table to check on the pup. “What’s up, Chip?” Nancy asked. The little chocolate Labrador was pawing the front door. Was somebody outside? Nancy stood on her tiptoes and peeked out the peephole. Nobody there. “It’s probably a squirrel,” Nancy decided. But when she opened the door a crack, she saw no squirrels anywhere. Nancy was about to shut the door when she spotted something strange on the doorstep.